How’d you like to skip the lecture on math and go straight to the MaLL? Not to shop, but to learn. That’s what UNM students, like Matthew Cossum are doing and it’s working. MaLL is short for Math Learning Lab, a new approach to teaching Intermediate Algebra. 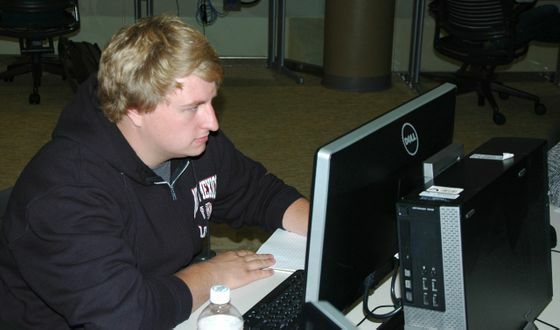 Matthew Cossum, a freshman who is no fan of math courses, likes the system, which is completely computer based at the Math 101, 102 and 103 levels. “You can work at your own pace," Cossum said. "It is very relaxed, very nice.” He just completed Math 101 with a perfect score and has launched into Math 102. Cossum didn’t like math in high school, and wasn’t pleased with a computer-based community college math course, which he dropped halfway through. But ALEKS, the software course available at UNM, suits his learning style. He is planning to major in philosophy so he expects to put college algebra behind him quickly this semester. Intermediate Algebra is the first math class for many UNM students, about 2,500 a year. Historically, it has been a course with a high failure rate, blocking many students from proceeding through the college math sequence and making progress toward graduation. In the fall of 2012, UNM opened the new MaLL on the first level of Centennial Science and Engineering Library. It is a redesigned collaborative learning space similar to a computer lab that uses adaptive learning software combined with personalized assistance to meet a student’s needs. Instead of one class – Math 120 - students now move at their own pace through a series of labs: Math 101, 102 and 103, each worth one credit hour, or they can jump from Math 102 into Math 129 or Stat 145. Freshman Matthew Cossum likes the MaLL approach. He just completed Math 101 with a perfect score and has launched into Math 102. “One of the reasons this method works so well is that students spend more time on things they don’t understand and less time on things they have already mastered,” said Associate Provost Greg Heileman. The new format addressed an old problem. Students who struggled with early lessons would eventually hit a wall, because math lessons become progressively more complex as the semester goes along. When the course was 3-credits sink or swim, 65 percent of those students sank. Now students complete the labs one at a time, ensuring that they get credit as they go. Students must also demonstrate mastery of content before proceeding and those still struggling to succeed are given more time to finish after the term ends. There is no way to cleanly compare the new model to the old one because students who get an incomplete can work into the next semester to finish the course. Now University officials are doing analysis to determine the rate of progress of students who have not finished the course and still have an “incomplete” grade. They are also looking at ways to incentivize students to finish, by either rewarding them by returning their course fee when its completed or charging them if they don’t finish. Courses at the MaLL have a ratio of 1 tutor to 10 students, so help is always near. Some students may always have trouble with math, but now they have several ways to approach the problem and at last more students than ever are succeeding. ** University Communication Representative Karen Wentworth contributed to this story.